I have to confess that I am sometimes impatient. (Michael will probably laugh his head off when he reads that statement.) Ok, maybe more often than that. When I make up my mind about something, it’s got to get done yesterday or no later than now. Right now I’m impatient with our container garden, which seems to be taking its own sweet time ripening our fruits and vegetables. We’re just dying to grab a bunch of colorful peppers and use them, but they are just hanging around and staying green. I planted red and yellow peppers, and so far we’ve only gotten two yellow peppers and zero red peppers. We’ve become impatient and have started picking them green so that we can eat them and encourage the plants to produce more. When we finally got a yellow pepper—one yellow pepper—I sliced it thinly and tossed it in this cabbage salad. The vinaigrette gives it a nice Asian twist that pairs well with the Thai grilled chicken I posted this week. The sesame oil has a strong flavor, so you may want to add just one teaspoon and taste test before adding more. This is another recipe using my favorite herb, cilantro, which ironically enough, is one herb that gives me fits when trying to grow it. Oh, I don’t have any trouble getting it to grow, but for some reason it seems to go to seed so fast that sometimes I don’t even get to use it before the leaves are done for. So I’m trying a new technique this winter in my kitchen garden. I’m going to try planting three different containers about two weeks apart, and then harvest as soon as the leaves are full, even if I don’t plan to use it right away. Then I’m going to chop and freeze it in cubes. It won’t be useful for garnish, but it will be great for cooking or even in vinaigrettes. 1. In the small bowl, whisk together the rice wine vinegar, lime juice, ginger, brown sugar, soy sauce, and sesame oil. Set aside for about 30 minutes. 2. 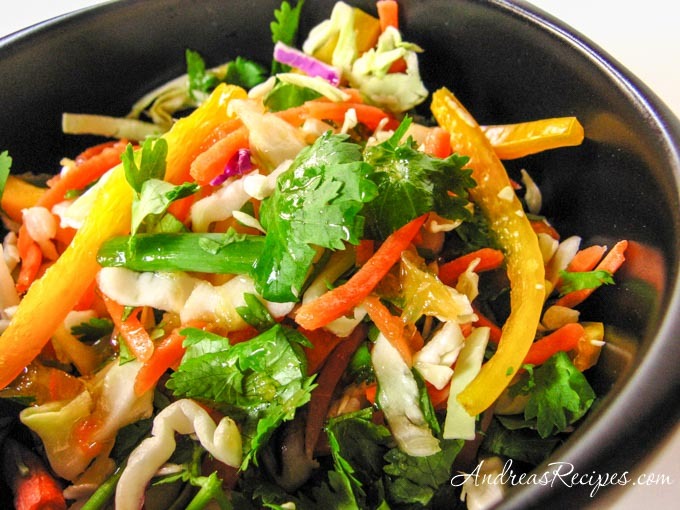 In the large bowl, toss together the cabbage, green onions, carrots, and cilantro. Chill until ready to serve. 3. Toss the vinaigrette with the cabbage mixture and serve immediately. Refrigerate any leftovers. This salad sounds wonderful. You’ll have to tell us how the freezing of the herbs goes. I have a bunch of herbs that won’t survive the winter once the cold hits – I thought of freezing, but didn’t know how it would turn out. Another one that sounds great to me. i love the idea of freezing cilantro (coriander, for us i think) – i always forget this very useful trick. i sometimes have way too much sage/ rosemary/ and freezing is such a great way to keep the flavors over winter as well. That photo is stunning! The salad sounds really good–especially the dressing. I’ll definitely have to try it. I used to have the same trouble with my cilantro bolting and couldn’t figure out why–until I discovered some volunteer plants coming up in the snow. I always associate cilantro with summer dishes that call for peppers and tomatoes, but it’s actually a cool weather plant. Go figure. I recently wrote a post about freezing summer squash and using a FoodSaver, and somebody told me that they vacuum sealed fresh basil (didn’t freeze it) and when they opened the package it was still perfectly fresh! I don’t see why it wouldn’t work with cilantro. Congratulations on the success of your container garden!!! This salad sounds really refreshing and showcases that yellow pepper, too. Deborah & Andreea: I got the idea for freezing herbs from Dorot, an Israeli company that freezes small cubes of herbs. I found their products at Trader Joe’s and decided to try it myself. I’ll be sure to share the story of how it worked. Susan: You know, I found some cilantro growing in my garden one winter and thought it was weird! You are right, I think cilantro prefers cooler temps, so I may have to set out my pots on the porch a few days at a time just to see what happens.